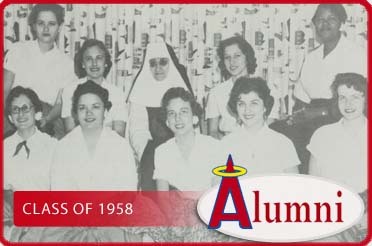 In 1871, the Sisters of the Incarnate Word and Blessed Sacrament opened Incarnate Word Academy in Corpus Christi, Texas. 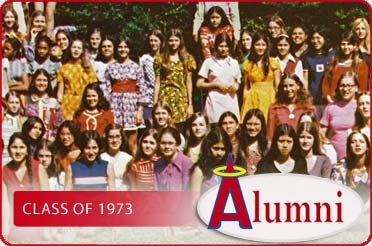 It would be 42 years before an alumnae program would be put into place. 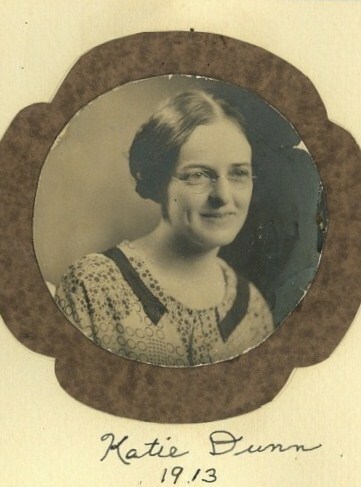 Katie Dunn was the first graduate of Incarnate Word Academy, and was the only student in the class of 1913. 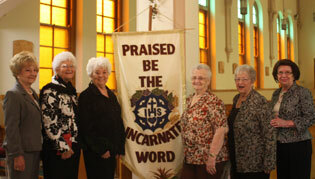 The Incarnate Word Academy Alumnae program was officially formed when she graduated. Katie Dunn pictured as an alumna. Katie remained the sole alumna until she was joined by the two graduates of the class of 1915. 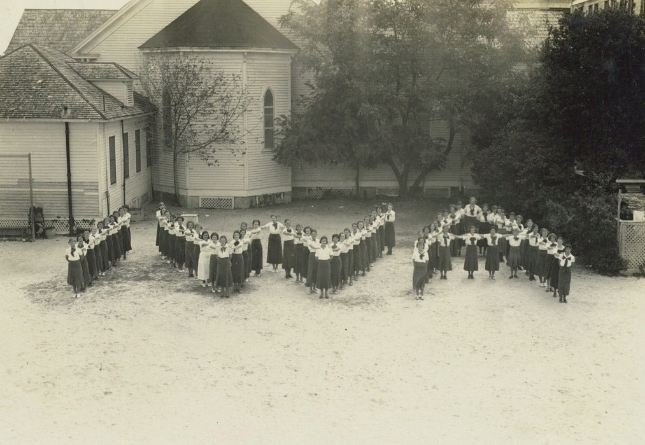 By 1923, there were an additional 16 graduates of Incarnate Word Academy, bringing the total number of alumnae to 19. At this time, Incarnate Word Academy was an all-girls school. 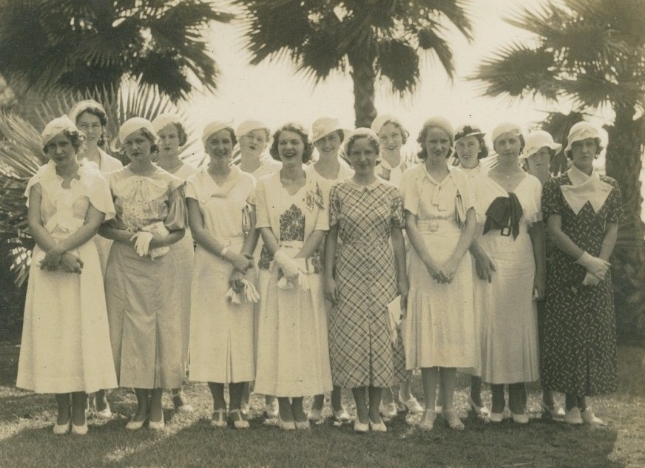 A beautiful “Doc McGregor” photo of IWA Alumnae celebrating on June 5, 1933. 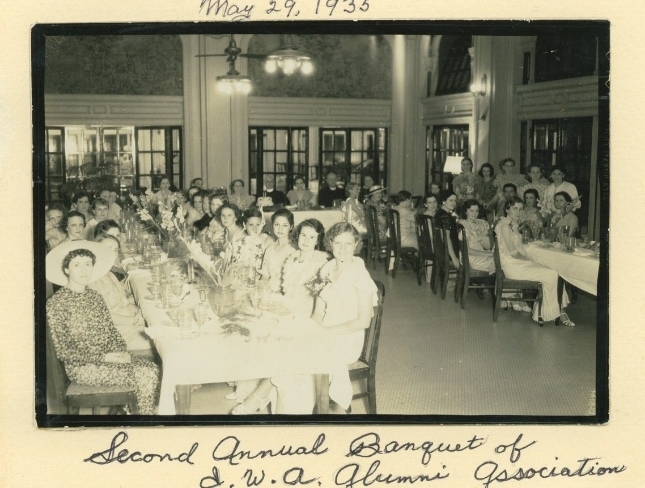 Second Annual Alumnae Banquet held at the Nueces Hotel, May 29, 1935 by Doc McGregor. Fast forward to 1926-1928. 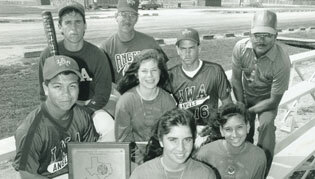 During these years there were eight boys who graduated from Incarnate Word Academy. 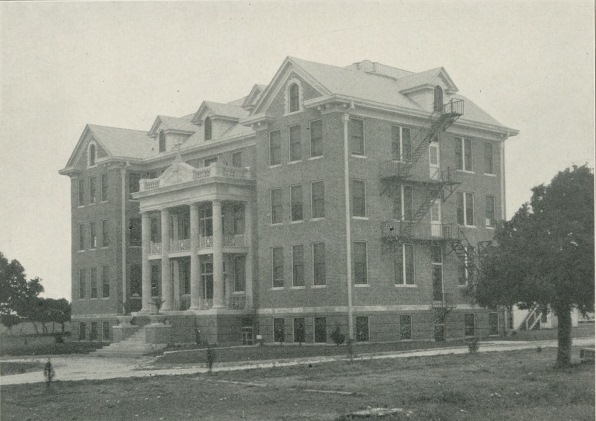 In 1928, male students began attending high school at Corpus Christi College Academy (CCCA), which opened September 11, 1928 with the Benedictine Fathers from Subiaco, Arkansas. It would not be until 1977 that the second group of male students would graduate from Incarnate Word Academy. 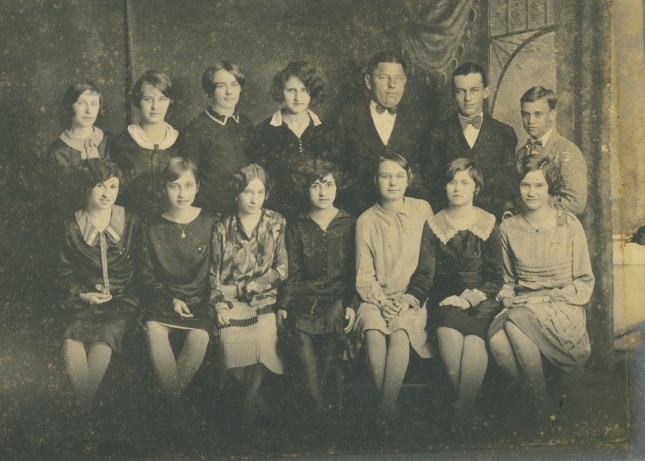 Incarnate Word Academy high school students gather for a group photo in 1927. 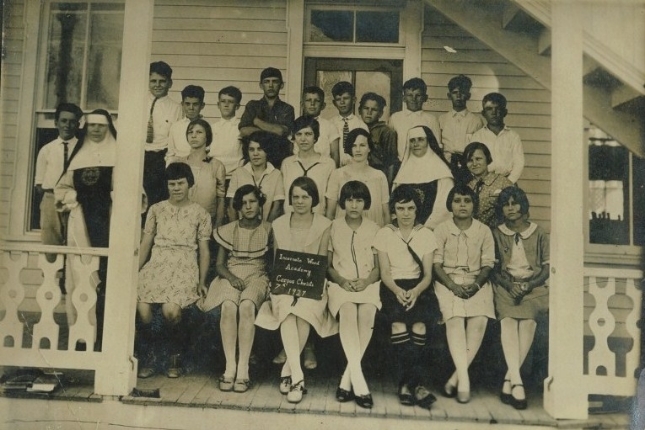 Incarnate Word Academy high school students in 1927. Corpus Christi College Academy in 1929. 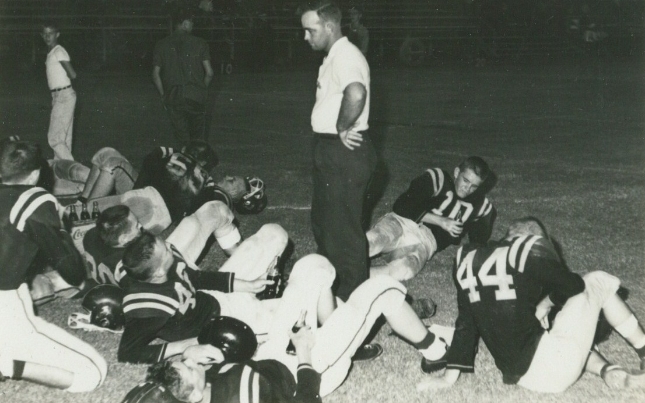 When CCCA played football, IWA supplied the cheer squad. When there was a dance to be had, it was hosted by both schools. They rode the bus together, celebrated homecoming together, attended academic events, took part in service projects, celebrated sacraments, and enjoyed leisure activities – together. CCCA educated the boys and IWA educated the girls. Many were brothers and sisters from the same family. IWA and CCCA cheerleaders show their spirit. From the moment CCCA was founded, the Academies were a blended family. Over the years, the interaction between CCCA and IWA students tells the story of Catholic education in our community. 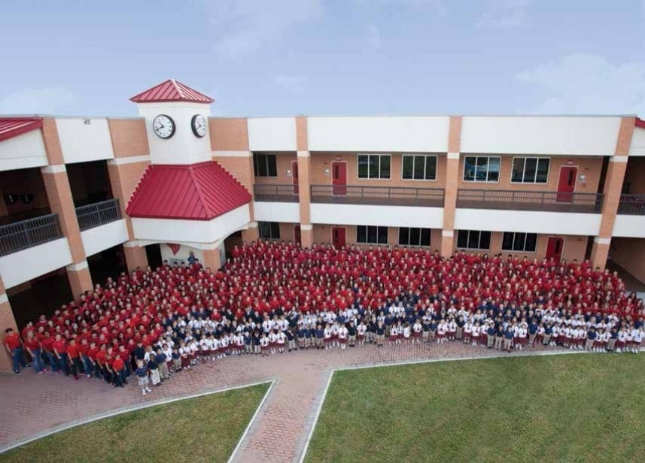 It is a unique heritage shared between the two schools. This fascinating and special relationship is documented in photos, scrap books, writings, newspaper articles, magazines, marriage certificates, baptisms, and death certificates. It makes perfect sense that when CCCA closed in 1972, IWA would officially “adopt” all alumni of this historical Catholic institution. In 2004, Billy Joe Carter CCCA ’53 and his wife, Janie Tiblier-Carter IWA ’53 purchased a Sacred Heart Statue that was originally presented to the Benedictine Fathers and CCCA in 1928 by Bishop Emmanuel B. Ledvina, D.D., LL.D. The Carters donated the statue to IWA. The statue that marked the Catholic identity of CCCA for many years and welcomed all to campus, would now stand tall at IWA to serve the same purpose. A blessing and dedication ceremony was led by Father Harold Heiman, OSB at IWA during the CCCA and IWA class reunion weekend honoring the classes of 1929-1972. Although graduates of CCCA will always remain graduates of CCCA, they are officially a part of the IWA Alumni Program. CCCA colors will always be maroon and gold, the team remains the mighty “Cavaliers”, and the “The Pilgrim” yearbooks will never be renamed. CCCA history is housed together with IWA’s on the same shelves, in the same room, as it always has been and always will be. Both are celebrated together under the name - Incarnate Word Academy Alumni. 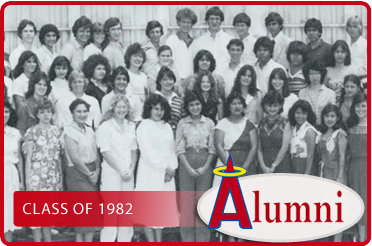 Today, your alumni program is comprised of over 5,000 members. Membership is free. Although our roots remain in Corpus Christi, Texas, our powerful network of alumni extends across the globe. With today’s technology, it is not hard for us to engage alumni wherever they might be in the world. While Katie Dunn had a composition book and a pencil, we now have the Internet. 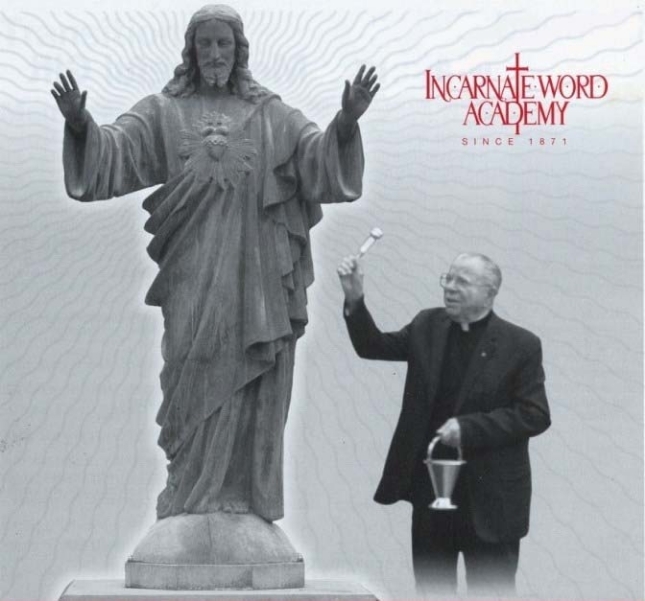 The Incarnate Word Academy Alumni Program exists to enrich the alumni experience, to foster lifelong connections between the Academy and alumni, and to continue to keep alumni connected to each other and to the heritage and history of their Catholic education. It provides opportunities for rewarding connections between alumni, faculty, current students and parents. Involvement in the campus community allows alumni to “give back”, to “restock the woodpile”, and to help other students receive a Catholic education. 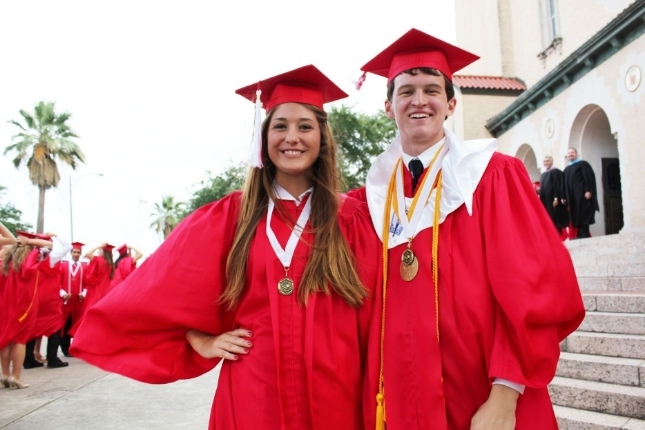 Upon graduation each year, students are automatically welcomed with a lifetime membership into their new relationship with Incarnate Word Academy. 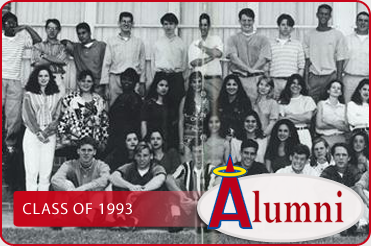 They become esteemed members of the family we call Incarnate Word Academy Alumni. There is no graduation from this new relationship. This one is permanent. 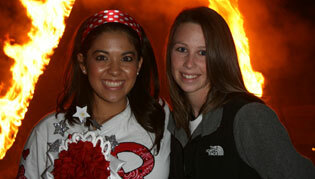 Although Katie Dunn has long passed, she is still referred to today as an Incarnate Word Academy Alumna. She is no different than you. Like you, she is a graduate. Like you, she is an alumna. Like you, she is a little piece of the history of Catholic education in our community. Over one hundred years ago, Katie paved the way for you. Now you walk in her footsteps. You are and will always be — forever IWA.